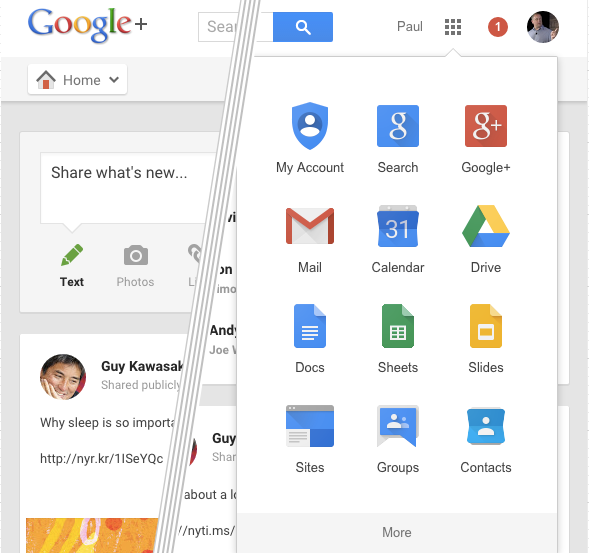 TL;DR: Google has a shared app-launcher flyout for different applications. It is injected into pages on the server-side (not client-side). It’s clear Google have a component linked in to each app, or a service that’s invoked per page-impression. Given Google’s tooling around their mega-trunk allows them to compile in dependencies easily my money is on the former and it’s not a service. The clicking on an app icon, causes a new window or tab to open. Maps is the exception though - it opens in the same window/tab. The variable names in the source, lead me to believe that Googlers refer to the whole thing as “one google bar”. When WebComponents is been embraced everywhere, Google implementation could change of course.